This tour is for the discerning golfer who simply wants the best. Combining the world famous Sun City, a Wildlife Safari, the Garden Route and the Cape Winelands - Plus you get to play 8 true championship layouts including 6 of the top 7 courses in South Africa. This two week tour begins at Sun City where you get to play both the Lost City course and the Gary Player Country Club (rated No. 2) before heading for Kruger National Park and a five star safari at Jock Safari Lodge plus 18 holes at (No. 1 rated) Leopard Creek golf course. 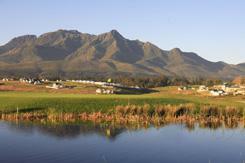 World class Fancourt golf resort follows where you play both The Links (3) and Montague courses (7). Travelling down the scenic Garden Route you next play Arabella golf clourse (4) near Hermanus before continuing down to the Winelands and Cape Town with golf at the Jack Nicklaus designed, Pearl Valley course (6) and either Erinvale (19) or De Zalze golf club (23). Arrive at Johannesburg International Airport, where you will be met and transferred via road to Sun City. After checking into your hotel an orientation tour of Sun City. Remainder of the evening to explore this world-renowned resort which has a myriad of entertainment and leisure facilities. (Optional) Relax after your round at the luxurious Lost City clubhouse which has beautiful views overlooking the course. This afternoon we suggest that you try the Valley of the Waves Pool and the various fun water slides or just soak up the sun on the Sun City beach. This evening try your luck at the Casino. (Optional) This evening after an early dinner take in the exotic Extravaganza Show. Early check out of Sun City and transfer to Johannesburg International Airport for the flight to Nelspruit where you will collect your rental car and drive to Jock Safari Lodge in the Kruger National Park. Welcome drink on arrival and lunch with time to settle into your lodge and unpack at leisure before your first close encounter in open vehicles with Africa's unique wildlife. Your knowledgable ranger will inform you of the interrelationship of the various facets of the eco-system as well as identifying the various fauna and flora. An early wake up call and coffee before setting off in search of the Big Five of Africa, (Lion, Elephant, Rhino, Buffalo and Leopard). These highly prized encounters are but a few of the exciting wildlife experiences that await the visitor to Jock Safari Lodge. Return to the Lodge for breakfast and a relaxing day at the pool before this afternoon's adventure into the evening (night drive) to spot some of the nocturnal creatures rarely seen. Return to the Lodge for dinner. Today you drive to Leopard Creek Golf Club for 18 holes on South Africa's top rated golf course and home to the European Tour's Alfred Dunhill Tournament. 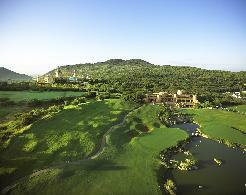 Available only to the very few priviledged golfers, Leopard Creek is a 'bucket list' venue. Return to Jock Safari Lodge for an evening Game Drive before dinner. Rise with the birds for a final Game drive and your last opportunity to enjoy the magic and mystique of the African Bush before returning for breakfast and check out for the drive to Nelspruit KMIA Airport where you drop off your rental car and fly to Johannesburg to connect with your flight to George. You collect your rental car and drive the short distance to Fancourt Hotel and Country Estate. Orientation tour and evening at leisure. 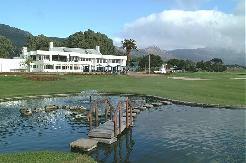 Tee off after breakfast on the beautiful Fancourt Montague . 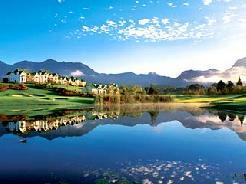 Fancourt is the SA home course of Champion golfer - Ernie Els and Senior Pro Tour Player - John Bland who both have homes nearby. (Optional) After golf visit the quaint town of Knysna for some sight seeing including the Knysna Heads, Lagoon and the beautiful Garden Route Lake District, returning to your hotel in time for dinner. 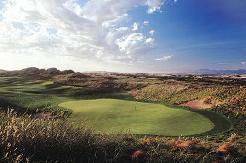 After a leisurely breakfast, Tee off at The Links, venue for the 2003 President's Cup. (Optional) Relax after your round at the elegant Spa or with a drink at the Sportsman's Bar overlooking the 18th hole. Check out of your hotel after breakfast, collect your rental car and drive along the scenic Garden Route - westward to Arabella Western Cape Hotel & Spa near Hermanus. (Optional) En route you may wish to have 18 holes at Ou Baai Golf Course, the magnificent Ernie Els design championship course. (Optional) After golf indulge yourself at the Spa or take a drive into Hermanus to explore the Whale Capital of the World. Check out and take a leisurely drive along the stunning coastal route via Gordon's Bay and Somerset West to Stellenbosch. (Optional) We recommend you have lunch at Vergelegen Wine Estate in Somerset West before heading on to River Manor situated in the heart of Stellenbosche and within walking distance to a host of restuarants. (Optional) After golf visit the historic Huegenot town of Franschhoek and possibly some wine tasting after lunch at a local Wine Estate. (Optional) Some wine tasting on the Stellenbosch Wine Route or Site seeing around South Africa's second oldest town before dinner at Terroir Restaurant. Check out of the hotel and spend the rest of the day relaxing before returning your rental car to Cape Town International Airport in time for your flight home.